E has certain things in his life that are very important to him. 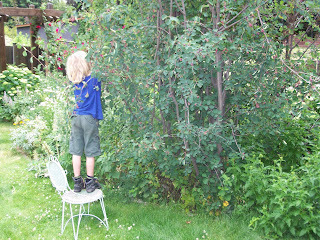 Dogs, big brother, biking and fresh food from the backyard are some of his main pleasures. Everytime I spot him in the yard these days he is picking something to pop in his mouth. I love watching him enjoying all these goodies and am so proud of the gardener that he is. 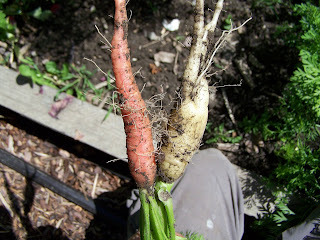 These carrots are from some heirloom seeds he ordered to plant in his garden bed. He picked these two yesterday to taste test the different colours. He says he also has some red ones growing. He has one going to seed and has decided to collect the seeds in hopes that some friends might want to trade seeds with him. I have to remember to show him this Jamie Oliver clip about carrots and gardening.